The rotator cuff is a description of a group of tendons around the shoulder which are crucial to the normal functioning of the shoulder joint. Quite commonly they are responsible for pain in the shoulder which is characteristically perceived in the upper arm. Doctors describe the pain which comes from the rotator cuff as impingement. The assessment of shoulder impingement usually includes listening to your history, performing a clinical examination and obtaining a simple xray. Further imaging can be helpful. A simple ultrasound is often sufficient and occasionally an MRI will provide other useful information. You will probably have tried some of these before coming to see the specialist. Not all steps are appropriate in all cases. Harry talks you through your clinic appointment for shoulder impingement. 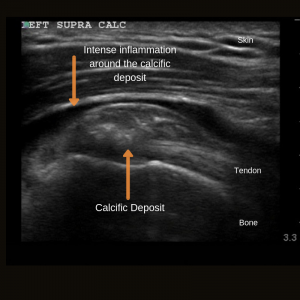 Calcium deposits within the rotator cuff tendon are quite a common cause of shoulder impingement. We dont understand why they occur. They are more common in people with hormonal disturbances such as diabetes, thyroid disease, or during the menopause, but there are lots of patients who seemingly have none of these risk factors. Occasionally it seems to run in families. It has nothing to do with diet or calcium intake. Generally there are two forms. 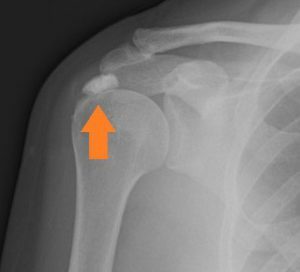 Acute calcific tendonitis – this is an agonising condition of the shoulder. It often starts very quickly overnight for no apparent reason. Pain is on a par with kidney stones, heart attacks and child birth! We dont know why it happens. The best treatment is rest, anti-inflammatory tablets and a cortisone injection. It usually settles down after about 10 days and rarely recurs. Chronic calcific tendonitis – this is the more common variant. It is often associated with persistent or recurrent impingement symptoms which don’t settle despite all the usual treatments. It is easily seen on x-ray or ultrasound. There are a number of treatment options ranging from waiting for natural resolution, shockwave therapy, cortisone injections, or arthroscopic surgery. The arthroscopic video below show a calcific deposit being expelled from the rotator cuff. Remember that the view is very magnified and that the instrument being used is only a few millimetres wide. People are also often surprised that the consistency of the calcium is often soft like toothpaste, and not hard or gritty like stone. Harry discusses this painful condition and the treatment options for calcific tendonitis of the shoulder. This operation is sometimes offered to people who have impingement symptoms which are not getting better despite trying all other treatments. It is often combined with other arthroscopic procedures depending on other pathology. It is a straightfoward and quick procedure performed under general anaesthetic as a daycase. It is safe and is often effective. However it is not a quick fix and most people find the first week or two to be quite uncomfortable. Thereafter things slowly improve and by 3 months you should be really good. To date Harry has performed 2490 simple arthroscopic procedures including arthroscopic subacromial decompressions, AC joint excision, excision of calcific deposit and long head of biceps tenotomy. For information regarding the operations of arthroscopic subacromial decompression, acromioclavicular joint excision, excision calcific deposit, and long head of biceps tenotomy click here. Read the diaries of a young woman or an older man undergoing these operations. The role of the operation of arthroscopic subacromial decompression has been called into question by a publication from Oxford. There is an inference from the paper that this operation does not work but actually it only tells us that we don’t understand how or why it works! Those patients who had the operation had a better outcome than those people who did not have the operation. I have many many satisfied customers which includes a number of shoulder surgeons themselves! I still believe that when offered in the right circumstances it is a safe and effective procedure. The response to this publication by the British Elbow and Shoulder Society can be found here. Imagine an old friendly pair of trousers. One day you bend down and they rip. That is because the material has become worn. This is the analogy for age and genetically related rotator cuff tears. Many people have these types of degenerative rotator cuff tears without even knowing they have happened. If they have developed gradually then the body has the ability to compensate with other tendons. In this scenario surgery is very seldom necessary. If pain and weakness are a problem then you will need to strengthen your anterior deltoid muscle to compensate for the torn rotator cuff. Download the exercise programme here. Instead imagine you have put on a new pair of trousers but rip them when you fall off your bike. This is the analogy of a traumatic rotator cuff tear. In these circumstances surgery would be advocated to repair your good tendon because it cannot heal itself. Many people have a slightly worn pair of trousers and then rip them by snagging a bramble. In these circumstances it is usually sensible to try to manage the painful symptoms with time, analgesia, a cortisone injection and some physiotherapy. If this strategy is unsuccessful then an operation may be considered. Information regarding the rotator cuff operation can be found here. For the postoperative physiotherapy protocol click here. Harry has performed 643 arthroscopic rotator cuff repairs. To read the diary of a woman who underwent a rotator cuff repair click here. Harry discusses when surgery is recommended and what to expect if you are having a rotator cuff repair.